My mom recently took a trip with her sisters, their kids and my younger two siblings. On their way to Mount Rushmore, they stopped at a delightful restaurant called, Perkins. My mom ordered a BBQ chicken Salad with a Chipotle Dressing and knew she had to recreate it as soon as she got back home. My family went and visited them a couple weeks ago and she made this incredible salad for us. Oh. My. Gosh. Let me just tell you about this salad. The textures and flavors compliment one another perfectly. The chipotle ranch dressing is probably my new favorite dressing. Together with the BBQ sauce, it will make this one salad you won’t forget and will have to make over and over again! This will be one salad you won't be able to forget and will have to make over and over again! 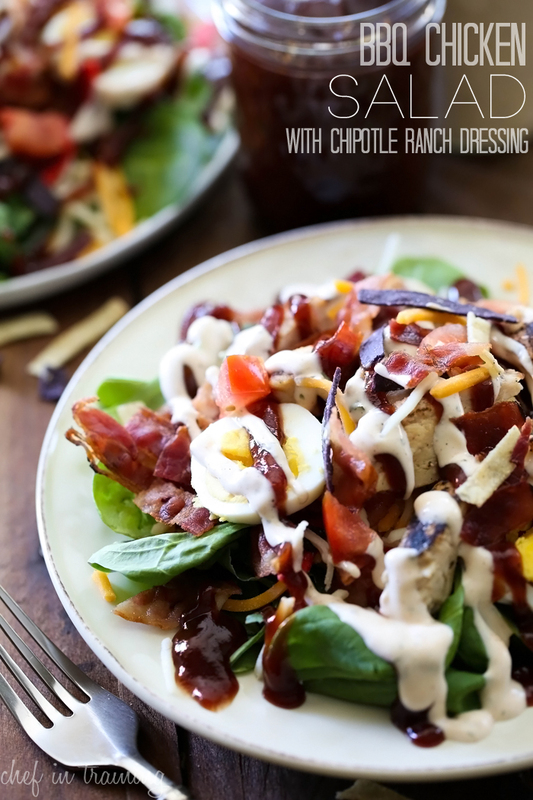 Combine all Chipotle Ranch ingredients and mix well to create dressing. Layer Lettuce, cheese, tomatoes, bacon, eggs, chicken, tortilla strips, BBQ sauce and Chipotle Ranch Dressing (May not want to use all of the dressing, it stores great in the fridge for later use). Perkins!!!! OMG!!! Perkins!! I grew up in MN and there are Perkins all over MN and that area. It was like Baker's Square for us. Thank you for reminding me all of the sleepless nights I spent at Perkins in h.s. and college studying with pots of coffee! I never had this salad but it looks amazing! Now you make me want to go to Perkins but it's a long way from San Diego :) Pinned! This looks amazing! I am having this for dinner! This is too funny...I am from South Dakota. I guess I didn't realize that Perkins is uncommon! Anyway, I am glad they enjoyed their trip and I look forward to trying this recipe. I just made the dressing and it's restaurant quality in the comfort of your own home! Thanks for jazzing up my boring chicken salad!